Magic Sam, like another Sam who lived in Chicago, Sam Cooke, was among the greatest vocalists of all time. Those who appreciate intense, passionate blues/soul singing will love this album. Although Magic Sam was also a genius guitarist, guitar aficionados would do better to experience any of the other Magic Sam Delmark releases. Similar to Magic Sam Live (Delmark 645) these performances were recorded by a Magic Sam fanatic, on a home tape deck. In this case, though, there was probably no remote thought or plans that the material would ever be released on the commercial market. Bill Lindermann was a close personal friend of Sam’s. 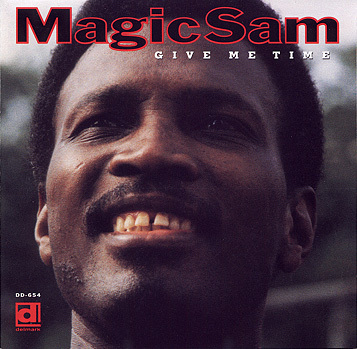 He recorded this album at Magic Sam’s house in January 1968 and was also involved in the earlier studio recording of six songs by Sam, four of which appear on the anthology Sweet Home Chicago (Delmark 618) and two on The Magic Sam Legacy (Delmark 651). The recording quality of “Give Me Time ” is not that of a session done at a professional studio, however, all that is currently technically possible has been done to the original tape source to provide the best sound possible. You’ll hear things like Sam’s kids playing in the house, somebody playing hand drums on one song or somebody reacting to Sam’s singing with a heartfelt ‘yeah!’ – that’s the informal and intimate nature here. Rare photos taken by Lindermann at Magic Sam’s house which have never before appeared anywhere are enclosed within as well as complete liner notes by the founding editor of Living Blues Magazine, Jim O’Neal. If you don’t have any Magic Sam albums we suggest you start with West Side Soul (Delmark 615) and Black Magic (Delmark 620). If you do and are now ready to get to know Sam more personally then take this album home and enjoy.